The City of Danbury, Connecticut welcomes you to experience our culture and Art. Take a look around and feel free to stop by any time. We are pleased to announce that the Weekly calendar is now available from Amazon's Alexa family of products. All you have to do is ask Alexa "What's the News in Danbury" and she will read the current calendar. Enable and configure your Flash Briefing today. Just a few of the things to do in Danbury. Sync to the link for the Complete Calendar. #DiscoverDanbury and even more at CivicLift. The Danbury Library is looking for Danbury residents to participate in their Oral History Project. The project will capture stories and experiences of Danbury residents including their history in the city, their love for Danbury, and the memories they've had with their friends and family growing up in Danbury. If you are interested in participating schedule an appointment to record your story. Acclaimed violinist Rachel Lee Priday and pianist Conor Hanick make their Ives Series debuts presenting an evening of sonatas and other works for violin and piano written by American composers in the 20th and 21st centuries. Ives’s 4th violin sonata, widely regarded as one of the greatest American violin sonatas begins the program followed by works by Aaron Copland, the series artistic director, Paul Frucht, and selections by Florence Price, who was the first female African American symphonic composers. Read more about Rachel and Conor here. The Danbury Music Centre presents the Danbury Symphony Orchestra, under the direction of Ariel Rudiakov, performing Gustav Mahler’s mighty Symphony No. 5 . This work with its broad emotional sweep, from tragedy to triumph, and distant horn calls, contains the famous Adagietto, Mahler’s beautiful love-letter to his wife, written in music. Location: Congregation Shir Shalom, 46 Peaceable Street, Ridgefield, CT. This concert is generously sponsored by Connecticut Family Orthopedics and Orthoprompt. Featured will be Hat City Flutes, Danbury Trombone Outfit, Westfield Winds and more! The Danbury Music Centre presents the Danbury Community Orchestra, under the direction of Stephen Michael Smith, in concert along with the members of the Danbury High School String Orchestra. This will be the DCO’s second year collaborating with the Danbury High School Strings who are directed by Mary Peters. Works include Ippolitov-Ivanov: Caucasion Sketches, Queen’s Bohemian Rhapsody and more! The chorus will be be singing selections from a number of larger works: Israel in Egypt by G.F. Handel, Mass in B Minor by J.S. Bach, Stabat Mater by G.B. Pergolesi and Five Mystical Songs by R. Vaughan Williams. They will also be singing some well-known compositions by: M. Haydn, W.A. Mozart, W. Billings, and G. Martin; and some less-known compositions by Makarov, and by J. Thoms. Admission is free. Donations are gratefully accepted at the door. Join the Connecticut Office of the Arts in honoring Connecticut residents who are doing extraordinary work in, for, or through the arts during the presentation of the Connecticut Arts Hero Awards. This year's Arts Heroes will be honored in a special evening event on Wednesday, May 1, 2019. This will precede and set the stage for Connecticut Arts Day on Thursday, May 2, 2019. Do you know a special someone - a HERO - who you would like to nominate? Learn more about the Arts Hero Awards and how to nominate your HERO below! Connecticut Arts Day celebrates Connecticut’s investment in and support of the arts and reaffirms the significant role the arts play in our state. The day includes special performances, panel discussions, presentations, workshops, networking opportunities, and the presentation of Connecticut Office of the Arts' Lifetime Achievement Award! The theme of Connecticut Arts Day 2019 is RELEVANCE! RELEVANCE is a key concept in COA's R.E.A.D.I. (Relevance, Equity, Access, Diversity, and Inclusion) strategic direction and practice. COA defines Relevance as: Meaningful or purposeful connection to one’s aspirations, interests, or experiences in relation to current society or culture. COA staff is committed to a culture that supports curiosity, action and awareness in, about, and through the arts. We are delighted to invite you to nominate a Connecticut Arts Hero! The Connecticut Office of the Arts introduced Arts Hero Awards to honor and celebrate Connecticut residents who are doing extraordinary work in the arts, for the arts, or through the arts in Connecticut. The Arts Hero Awards have introduced us to remarkable individuals engaged in or supporting the arts - some publicly and some behind the scenes. If you know a special someone who is an ARTS HERO, we hope you will take a moment to nominate them for a 2019 Arts Hero Award! The deadline to submit a nomination is Thursday, March 28, 2019. Virtuoso performances, in a pitch-perfect setting. Hear top international musicians in an accessible, state-of-the-art venue, at truly affordable prices: season subscriptions are $65. Admission is free for students 18 and under. The series pick up again in the Spring. All performances take place on Sunday afternoons at the Veronica Hagman Concert Hall, located in the Visual and Performing Arts Center (VPAC) on Western Connecticut State University’s Westside Campus in Danbury, CT. Sponsored, in part, by the Danbury Cultural Commission. In the history of classical music, there has never been a major orchestral and choral requiem written as a memorial for the children we have lost to violence! It was with this thought that Eric Lewis began composing the Lullaby Requiem. The Lullaby Requiem is conceived as an eleven movement symphony. Six movements are currently completed, the other 5 awaiting funding that will allow the project to continue and move forward into production. Bring Uncle Sam back to Danbury! Help Mayor Boughton and the City of Danbury bring Uncle Sam back home through a Go-Fund-Me campaign! Uncle Sam once stood at the historic Danbury Fair and it is time that he returns to his rightful place in Danbury. The Uncle Sam statue welcomed all fairgoers during the final decade of the Great Danbury State Fair. This statue is 38 feet tall, likely the tallest Uncle Sam statue in the world! It was purchased by the Magic Forest Amusement Park in Lake George, NY in 1981 where it stands tall today. We plan to purchase the statue, restore Uncle Sam, and bring him home! The goal is $50,000 and so far about 3 dozen people have contributed in just a few days. Be a part of the return trip. No donation is too small, and none is too large! Your donation will help fund the purchase, transport, and restoration of Uncle Sam! Head to the Go-Fund-Me page for your opportunity. Sync to the Link https://www.gofundme.com/bring-uncle-sam-back-to-danbury . The Elizabeth L. Mahaffey Arts Administration Fellowship provides funding to arts administrators to pursue professional development activities that will advance their careers in arts administration. Arts administration is the field that concerns the business operations of an arts organization, including but not limited to staff management, public relations/marketing, budget management, fund-raising, program development and evaluation and board relations. have a minimum of two (2) years and no more than ten (10) years of experience in the arts field. Fellowships are non-matching awards of $2,500. There is no predetermined number of Fellowships to be awarded. The Connecticut Office of the Arts determines the number of Fellowships awarded. Travel and hotel costs associated with attending a workshop, conference or training. Costs incurred outside the funding period. Applicant Information: Include full name, title, affiliated arts organization and contact information. Required Attachments: Applicant’s resume and one (1) letter of recommendation from applicant’s affiliated arts organization. Send email with attachments to rhonda.olisky@ct.gov. The subject of the email should read 2019 MAHAFFEY FELLOWSHIP: Your Name. You will receive a confirmation email. Applications are due March 29, 2019 by 5:30 pm. The Elizabeth L. Mahaffey Arts Administration Fellowship is named in honor of Elizabeth L. Mahaffey, a former staff member who was an extraordinary mentor to young professionals pursuing a career in arts administration. The Fellowship was established upon her retirement after more than 20 years of dedicated service at the Connecticut Commission on the Arts. 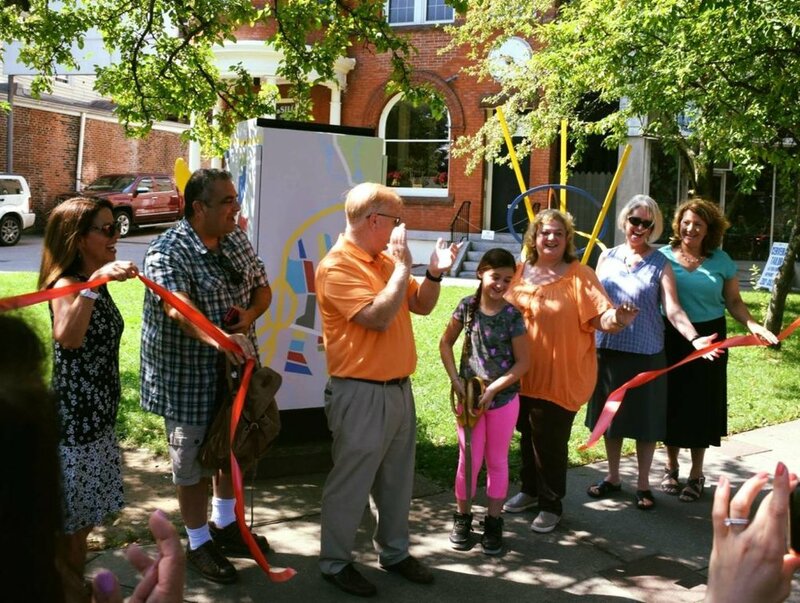 In Fall of 2017, Mayor Boughton asked local artists and graphic designers to submit draft proposals for consideration in the City’s Traffic Box Art Program. A selection committee chose 7 artists for our first round of 9 traffic boxes. Art was prepped by Merritt Big Color and placed on vinyl wrapping for our traffic boxes. Arts & Economic Prosperity 5 is Americans for the Arts' fifth study of the nonprofit arts and culture industry's impact on the economy. It documents the economic contributions of the arts in 341 diverse communities and regions across the country, representing all 50 states and the District of Columbia.